Let’s take a look at From the Vault: Angels this week to see if the average $75 price for the box is worth it for picking up what could be a gem of a collector’s item. First though, I want to talk about From the Vault: Dragons for a little bit. We can all agree that this FTV is the rarest one out there – it was the first, Wizards didn’t know how the product would be received, so I imagine there was some hesitation in releasing mass quantities of this product. That being said, let’s take a look at what the sealed and single prices of the cards from the set go for in the current market. Sealed Box – These currently go for $200 BIN on eBay. Nicol Bolas is killing it here, commanding the large majority of the value of the first FTV. Even though this form of Bolas is only a dragon creature rather than planeswalker, the iconic card still holds collector value from this set because he is Magic’s biggest baddy. Next up in value is Kokusho, the Evening Star because of how insane he is in Commander (remember, for a long time he was on the Commander banlist!) and how much players love to foil out their Commander decks. All told, the value of the singles is about $171.18 if purchased separately. That’s kind of a lot, considering the likes of Shivan Dragon and Ebon Dragon are in this package, which may have been iconic to the game but otherwise are basically unplayable cards in today’s Magic. The reason I want to talk about FTV Dragons and its prices is because Dragons are one of Magics most popular creature types, so I’m thinking that the trajectory of FTV Angels will match that of FTV Dragons, especially considering that some of the more iconic Angels are also getting makeovers to add to the collectability. FTV Dragons was released in 2008, seven years ago at this point. Let’s keep this mind when reviewing the Angels product. Sealed Box – These currently go for $75 BIN on eBay. Already, we can see that the singles prices of the angels are significantly more than sealed boxes, clocking in at $136.07 for the singles rather than $75 for a sealed box. Honestly, this price for a sealed box looks like a steal compared to buying singles, especially seeing that the sealed price of a similar product FTV Dragons has appreciated to $200 over the years. Realistically though, I would not want to be waiting around more than half a decade to get a return on this sealed box. I’m surprised that Dragons hasn’t creeped up higher, but compared to Vintage collectibles I think people would rather pick up their Lotuses, Moxes, Recalls, Timewalks, and other extremely rare Vintage staples rather than pick up the more casual FTV sets. This can clearly be seen by the trend upwards that Power and other similar Vintage staples have been experiencing over the same seven years as the FTV Dragons product. 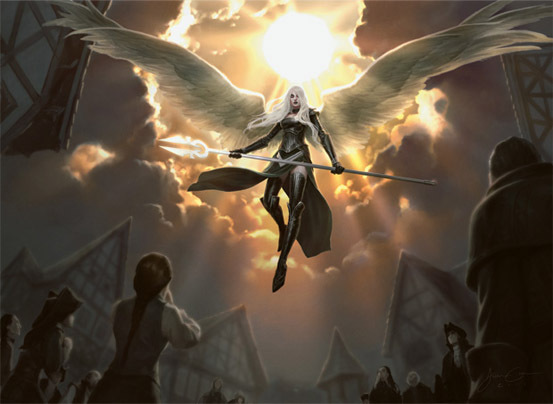 OK, looking at the singles themselves I think it’s no surprise that Avacyn is number one on the list. Unfortunately, she did not receive alternate artwork for this set, which means that she was merely included in order to reduce the market price on other Avacyn’s. Not that this a bad thing – my own opinion is that reprints like Modern Masters should happen more often, and given a wider release so that more players have a chance to pick up pricier casual staples. However, for a special release product like this, where they had to know that Akroma already has a reprint with alternate art, that Avacyn would be the headliner angel and thus should have given her alternate art. Yes, Furious Akroma also has alternate artwork (which is awesome) but I think from what we’ve seen from these types of products that players are looking to pick them up to collect rather than play with them. I mean, not that Nicol Bolas is trash or anything, but he certainly isn’t the strongest Dragon out there these days and definitely isn’t an auto-include in every Grixis Commander deck. 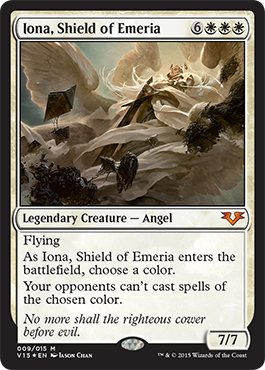 I’m really glad that Iona got the alternate art treatment, however I’m not sure that Iona needed to be included in this product since she was just reprinted in Modern Masters 2015. This reprint will further suppress Iona’s price for the time being. Yet, due to the alternate art I have a feeling that in the long run she will rebound in price as casual players start picking up foil copies in order to complete their un-fun Commander decks that cheat her out on turn two. Other interesting includes were Aurelia and Platinum Angel. Did these cards necessarily need a reprint, with one being so close to its Standard rotation and the other having multiple previous reprints? Again, I’m not sure if this was to add value to the product or to try and reduce the price of foil copies of the cards that are already out there. However, I am glad that Tariel, Reckoner of Souls finally has a foil which great for those who have her as a Commander or want to finally foil out a Mardu Angels Commander deck. 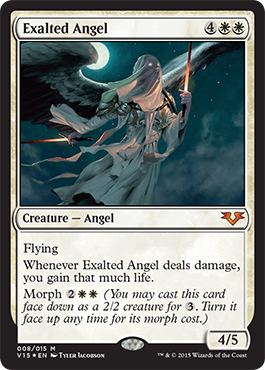 Even though the rest of the angels are pretty cheap, I have to say that I like the new art on Exalted Angel. It’s quite a difference between the iconic Onslaught art but I think that Tyler Jacobson really knocked the art out of the park. Sure, we have a Judge Foil version of the card too, but I think Wizards was looking at reprinting popular angels without caring about which cards haven’t gotten reprints yet (like the Powerpuff Girls from Avacyn Restored). I think FTV Angels has some really cool includes, but I think that there just isn’t enough in here to justify buying the singles. The package deal is $75, and I think that ultimately the singles will lower enough to match this package entry point. And unfortunately, if FTV Dragons has anything to tell us it’s that even seven years out this package won’t be much more expensive than it is now. That means you’ll have plenty of time to pickup these premium Angels folks, so I suggest in the meantime to start picking up things like Khans fetchlands instead because we can all agree that those are going to be getting us profits in a quicker, more efficient manner.